WASHINGTON (AP) -- Speaker John Boehner said Wednesday that the House will not hold formal, compromise talks on the Senate-passed comprehensive immigration bill, a fresh signal from the Republican leadership that the issue is dead for the year. 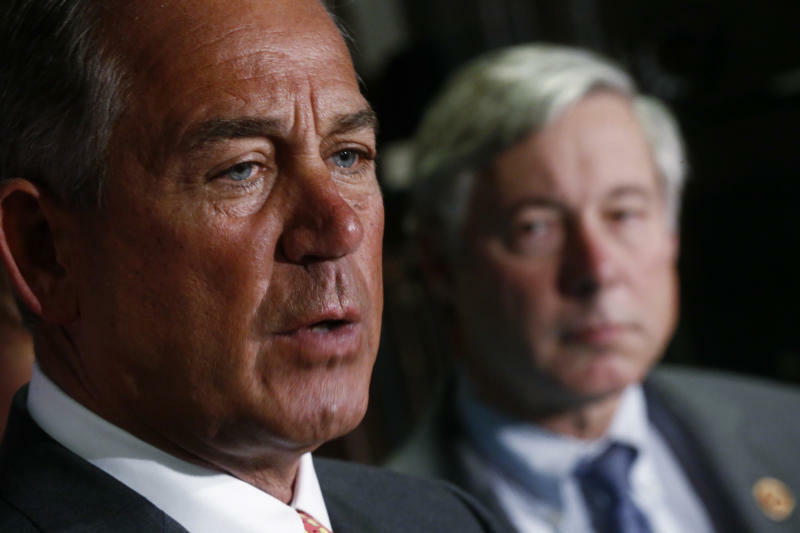 Boehner, R-Ohio, insisted that the House is focused on a piecemeal approach. But he declined to say whether lawmakers will consider any legislation this year or whether the issue will slip to 2014, when the politics of congressional elections further diminish chances of action. The No. 3 House Republican, Rep. Kevin McCarthy of California, had told immigration advocates last week that the House won't vote this year. "The idea that we're going to take up a 1,300-page bill that no one had ever read, which is what the Senate did, is not going to happen in the House and frankly I'll make clear we have no intention of ever going to conference on the Senate bill," Boehner told reporters at a Capitol Hill news conference. He said Rep. Robert Goodlatte, R-Va., the chairman of the House Judiciary Committee, is working on "a set of principles to help guide us as we deal with this issue." The Senate bill, passed in June, would provide a path to citizenship for the 11 million immigrants living in the country illegally and tighten border security. The House Judiciary Committee has approved piecemeal bills, but they have languished since the summer despite intense pressure from religious groups, business, labor and immigration advocates. Although House Republican leaders say they want to resolve the issue, which has become a political drag for the GOP, many rank-and-file Republicans have shown little inclination to deal with immigration. The bitter standoff with President Barack Obama on the budget and near default further angered House Republicans, who have resisted any move that might give Obama an immigration overhaul, the top item on his second-term domestic agenda. Many House Republicans are wary of passing any immigration legislation that would set up a conference with the Democratic-controlled Senate, fearing the House could lose out in final negotiations. Before the news conference, several immigrant children approached Boehner as he sat down for breakfast at a Capitol Hill diner and described how they could lose parents to deportation. The children were in Washington as several organizations maintain their pressure on the House to act on immigration. Carmen Lima, a 13-year-old from California, told Boehner that she feared never seeing her father again and asked Boehner if the group could count on Boehner for his vote. "Well, I'm trying to find some way to get this thing done," Boehner said. "It's ... not easy — not gonna be an easy path forward. But I've made it clear since the day after the election that it's time to get this done." Democrats expressed frustration over the House's lack of action at a House Judiciary Committee hearing on enforcing laws to deal with legal immigrants who overstay their visas. "If we can vote 45 times to gut Obamacare and have another vote scheduled this week, why can the Republican Leadership not find the time to schedule one vote on immigration?" asked Rep. Luis Gutierrez, D-Ill. "They say that where there is a will there is a way and I think there is time to get something done, but I don't believe the Republican Party has the will to do it."